One might say by this point, "it is all over but the crying." 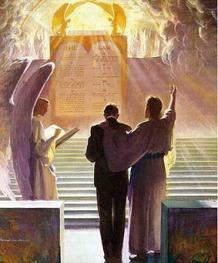 I will show in this message that Christians will already have had their "judgment" at the judgment seat of Christ, and that the Great White Throne of Judgment (often called Judgment Day), will be the final judgment of the wicked. While this book is primarily about the rapture of the church and the last days, it also involves the judgment and demise of the wicked. I would like to take the opportunity here, to debunk the mistaken concept, that Judgment Day is for everyone. So many Christians are brow-beaten over it and since it is part of our biblical timeline, I will show the simple truth of the matter. First let us consider the main verses involved. This confirms the verses in 1 Corinthians 3, posted earlier. When Paul writes "whether good or bad" - he is referencing a certain kind of judgment. It is the judgment of eligible or ineligible works. The ineligible works will burn up. Eligible works that pass will be rewarded; this is the kind of judgment for believers. At the judgment seat of Christ, saved people will stay saved and our "good works" will be either rewarded or counted ineligible depending on how the Lord judges them. When a Christian's sins are gone, they are gone. There is no judgment for something that is not there. At the final judgment of the lost, they will stand before God and their full account will be required of them because they rejected God and His pardon. All sin and works will be revealed. They will go from there to their eternal separation from God, eternal punishment (Romans 6:23, Matthew 25:46). So when is this "judgment seat of Christ"?